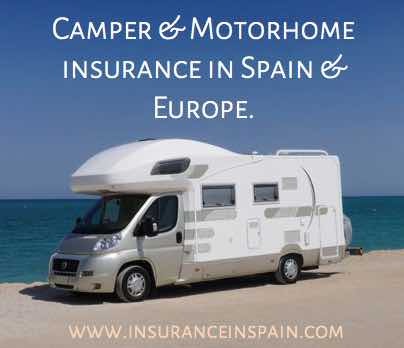 CAMPERVAN, MOTORHOME & RV INSURANCE IN SPAIN & EUROPE. EASY & AFFORDABLE PAYMENT TERMS FOR ALL YOUR INSURANCE NEEDS. are a very common sight in Spain. It is such a pleasant way for camper van owners to travel in Spain and through Europe. Thousands pass through or come to stay on a variety of Campsites and specific areas. Most towns have designated areas where camper vans can hang out and there is a vast quantity of good quality campsites scattered all over Spain. So whatever you want to do can be done and traveling with your own motor home, caravan or camper van means that you can travel at your leisure and stay as long or as little as you like in areas you enjoy. At www.insuranceinspain.com we are aware of the fact that you are transient and may also travel to other countries in Europe and sometimes further afield. Our camper van insurance products will offer you the protection you need to travel throughout Europe and can often be cheaper than insuring your vehicle back home. 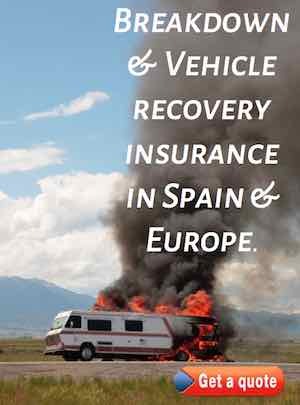 Remember that insurance purchased through us in Spain will be valid in the UK and Europe. Many people choose to visit Spain during the winter months as we do not often have severe weather and the roads are so much quieter than in the summer months. The weather is certainly better than the UK. However, this does mean that campsites are a lot busier in the winter and can be a bit more expensive as you are a captive market. There are literally thousands of Campsites scattered all over Spain and the best place to find them whether official campsites or not, is on the internet. There are also a lot of (safe) parking areas to park overnight. There have been some questions raised along coastal areas about allowing parking for campers, motorhomes and caravans on or near seafront areas as it is felt that these vehicles should have their designated areas. Concerns over the tipping of water waste and other materials in or near the sea have been reported and we assume this is a bid to stop such practices. We will update here if there is any changes to rules and regulations. Most of the official campsites and motor home parks listed online are generally of a very high standard and have most of the facilities you may need. Toilet facilities, showers, electricity supplies, shops and small supermarkets are often on some of the bigger sites and most are within a short distance of a village that will have just about anything you need. Most speak English and can be booked online before your arrival. Some do close for one or two of the winter months so it is best to check that they are going to be open before you travel. Do be aware that many of the towns and villages in Spain can have very narrow side streets and some bends can be at right angles and very awkward to navigate and negotiate. Blocking a narrow road will not make you very popular. Security on official campsites is normally very good but it is always good practice to stow things away when you are not there and make sure everything is locked up. Some sites may have CCTV cameras and security guards, particularly during the busy times of the year. Make sure you have padlocks and/or chains on ancillary equipment such as bicycles and scooters. Fuel, diesel, petrol, butane and propane gas are available at most service stations and some of the campsites also keep stock of such things. There is a growing network of LPG refill stations and some service stations will have a multitude of fittings to suit most European requirements. The electricity supply in Spain is 240v but the voltage can fluctuate down to 220v making heaters and electrical appliance take a little longer to heat up. Wash down areas and water tank disposal areas are available in most campsites. Please do not dispose of waste materials in unauthorised areas. Illegal dumping of water waste can result in a heavy on the spot fine. Most official and some of the bigger campsites do offer free Wifi. If not then you can usually find a local bar with free Wifi if you purchase a drink or some food. Most campsites will allow pets. Dogs must be kept on a lead at all times within the campsite area. If you do have a dog and it is over 20kg, be aware that that it will be classified as a dangerous dog and as such the law requires that you to have a minimum third party liability insurance to protect against any third party claims or in the event that your dog should bite someone. Click here to see more details about the laws governing dangerous dog breeds and any dog over 20kg in Spain. There are thousand of free camping areas in Spain and there are areas on or near beaches, in forests and parks, near rivers and caves that you can explore for free. In a camper you have the ability to travel freely and openly without too much hassle. Please respect the environment and this trend will continue. Remember to take away any rubbish and clear up after yourself. As a general rule do not free camp within 200meters of the sea, keep the group down to a maximum of 3 campers, tents or caravans in the group and not too many people when in or traveling as a group. Don´t camp too close to an official campsite as this is frowned upon. By all means visit the campsite for food and refreshments but remember that the campsite earns its living from offering these facilities and camping close by, outside the campsite will not make you popular. To complicate matters further, there are 17 different autonomous regions in Spain and each have their own camping laws that vary from region to region. Some regions such as Andalucia, Aragon, Asturias, Extramadura, and Valencia do not allow any form of Free camping. So do your research before you travel. NEWS:- Read the latest news on Campervans in Spain. www.insuranceinspain.com are providing this information for you and whilst we try to ensure that the information provided is accurate at the time, laws, rules and regulations do change and we cannot be held responsible for any out of date or inaccurate information. After all, we are an Insurance Agency and we do like to help our potential and existing clients by providing information that may help you whilst traveling and visiting or living in Spain.